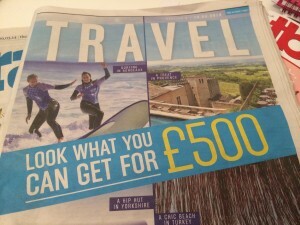 The Sunday Times Travel Section 2014 On Sunday 13th April 2014, The Sunday Times travel section featured “Got £500? The World’s At Your Feet”, this was an article on their best ways to spend under £500 on a travel experience. Feral Surf made it to their top 15 experiences for 2014. 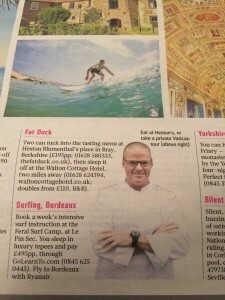 We even found ourselves next to Heston and his Fat Duck… Being put in the same category as his food can’t be a bad thing!! If you have never been to the Fat Duck we would highly recommend it by the way! !